Hi friends, I thought I’d write you a nice post right after Pi Day this year to share how we celebrated, but then my (very new) MacBook started doing this cute thing where it would randomly turn CAPS LOCK on internally by itself and refuse to turn it off, making it impossible to type ANYTHING THAT DIDN”T LOOK RIDICULOUS and locking me out when I would try to restart the laptop because it didn’t recognize the password (since it was wrong, being in CAPS, naturally…) Happily it has just returned from Apple with a new keyboard and we’re on our way again here! Levi and I have been living in a 735 sq. ft apartment in downtown Los Angeles between Little Tokyo and the Arts District since this past September. It’s been a great experience for a number of reasons. Living in a city can be exciting; there’s so much to see and do and most importantly EAT. We have been able to spend more time together just as the two of us, as a couple, and really feel like best friends more than ever. And we have absolutely loved the opportunity to attend a small Spanish-speaking church in Koreatown regularly. My Spanish still isn’t what I ultimately hope it will be, but the members of the ecclesia are great about helping me practice and speaking slowly when we talk! We have also been able to host visitors in our new place–though it’s small, our couch is comfortable and our spirits are willing. For their Spring Break this year, we were able to have my cousins Leanna and Daniel and friends Ari and Mara with us. It is pretty cool when your cousins who are ten years younger than you actually want to spring break near/with you, I have to say. The day they arrived we had a plethora of visiting friends at church downtown! On the Wednesday of the Spring Breakers, 3/14 (we all know the significance of this day by now I should hope), I was realizing that I had yet to make a new pie from the Pie cookbook in our DTLA apartment (I’ve made new ones during this year, like Cherry Custard Pie, Maria’s Double Crust Walnut Pie, and New Hampshire Raspberry and Red Currant Pie, but all while traveling). This was a serious issue, especially as I had the audacity to bring my “Fresh Baked Pies Made Daily” sign downtown with us to hang in my kitchen. I settled on Bittersweet Chocolate Turtle Pie for our Pi Day celebration. Ken’s description of this one suggests “Serve this kid-pleaser for a pajama party,” and while they’re not kids anymore, a week of six people in a one-room apartment is basically a non-stop pajama party come to think of it. 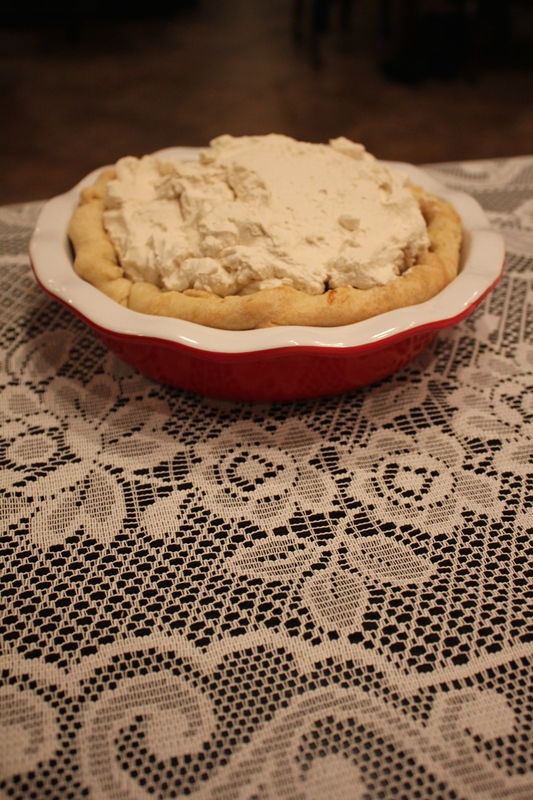 I baked the pie in a beautiful dish that the “kids” brought to me carefully stowed in their luggage-a belated Christmas gift from my Aunt Ruthanne! 1. New empty beautiful pie dish! 3. Bottom is covered with a layer of toasted pecans. 4. Layer of pre-bought caramel sauce that you’re a little embarrassed of but it was really hard to find a normal bag of caramels to melt down for a homemade sauce anywhere in or near Little Tokyo. 5. Whipped cream cheese with some added vanilla and powdered sugar gets “spread” on as the next layer as best as possible. 6. Best part…lots of bittersweet chocolate whipped cream gets piled over the top, covering the messy layers beneath. 7. Prior to serving, the pie is decorated with whipped cream, and makes a statement about the importance of the day if/when appropriate. We wrapped up in blankets and took our Pi Day celebration up to our rooftop, where we could enjoy a stunning view of downtown between bites of pie! I’m quite behind on sharing the pies I baked last year and wanted to take this opportunity to time travel quickly back to Pi Day 2017, when I made a Tyler Pie to bring to one of my school sites in Orange County. I had no idea what a Tyler Pie entailed before I made it, and I’m guessing you probably don’t either. Apparently it is named after John Tyler, the 10th president (maybe he had a sweet tooth?) and it is essential a sweet custard pie with a caramelly flavor (in keeping with the theme of caramelly pies for Pi Day, it seems). Tyler Pie is very easy to make. If you can melt a bunch of butter in a pot with cream and brown sugar and salt, you can make a Tyler Pie. 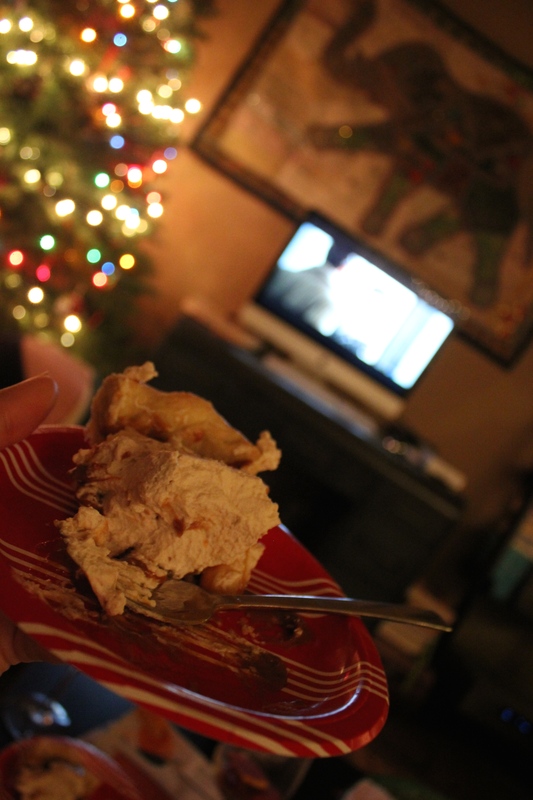 Last week, I continued my seasonally appropriate blog posting with a pear pie I made for Christmas Eve. Today, I will be sharing some pictures from Christmas Day itself. It started out with early morning gifts and chats with Matt and Carmel, who had just arrived from Canada the night before. We were gearing up for a week and a half of incredibleness. 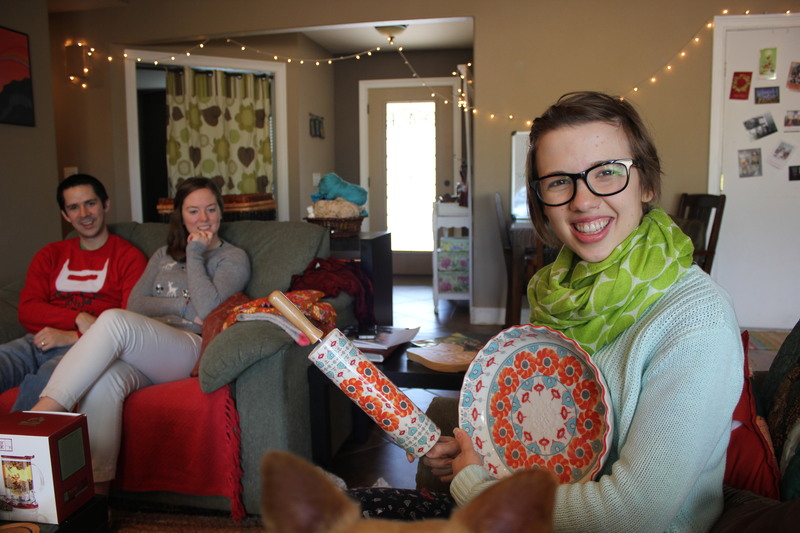 Here’s me loving my new Anthropologie rolling pin and pie plate from Levi. Beauty. 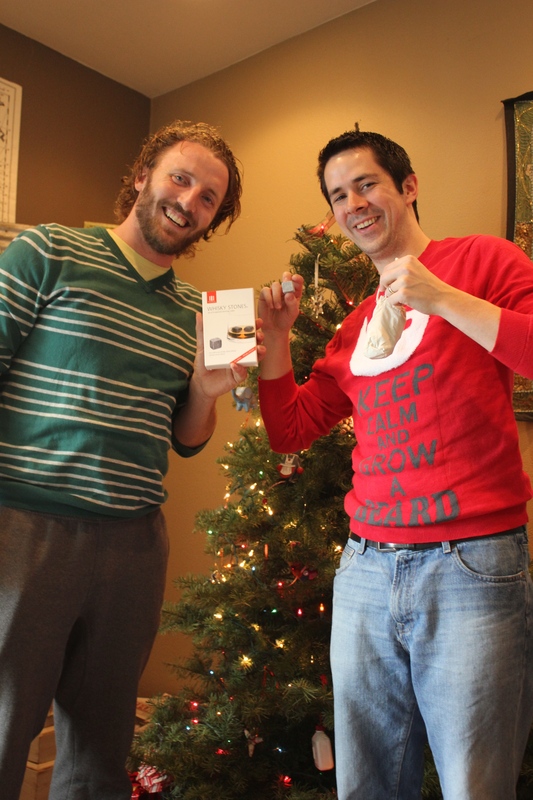 These biffles unwittingly got each other whiskey stones. How adorable is that. 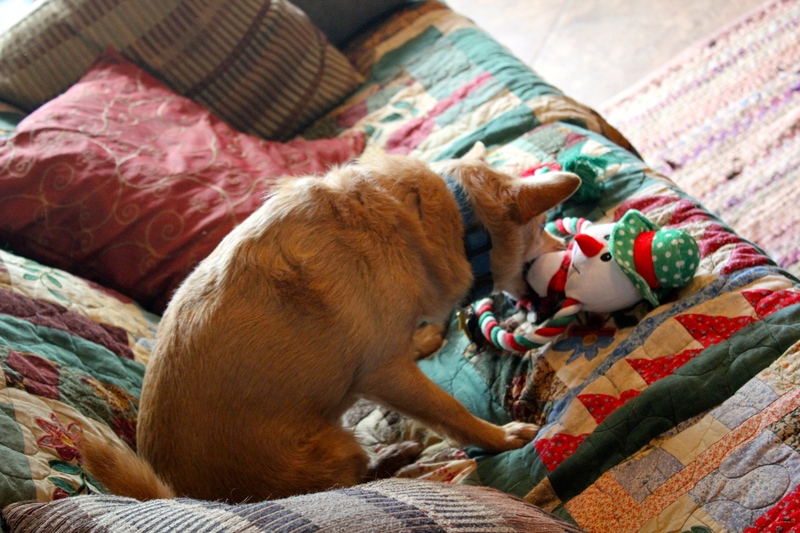 After Obi unwrapped his new toy snowman, some serious bonding time ensued. 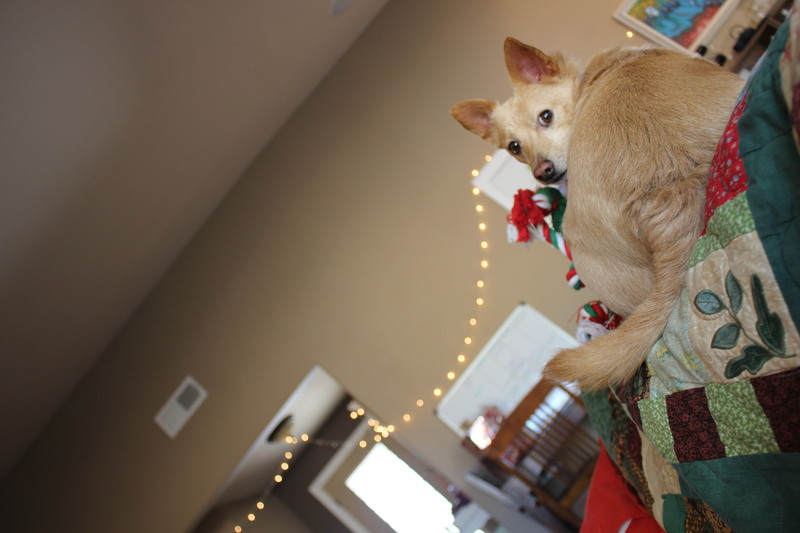 He then absconded with the snowman to the top of the couch. 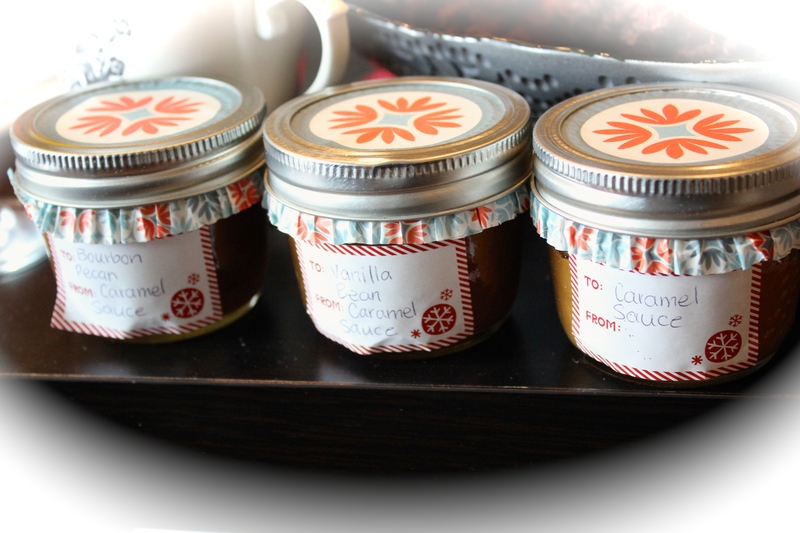 As befitted her name, Carmel bestowed us with a trio of homemade caramel sauces. Later that evening, the Collisters joined the Gelineaus and Colbys to form possibly the first group of carolers Simi Valley has seen in 40 years (at least that’s what one of the neighbors told us, with teary eyes). We were largely greeted with excitement, cell phone videotaping, and wide-eyed little children, and decided that this was our new favorite Christmas activity—one that we hope to make a true tradition. Levi and I don’t have many of those yet, other than Christmas dinner Mexican-style. Tamales and tortilla soup all the way, baby. Now we get to the pie, which in fact stems from another Christmas tradition—maybe we have more of them than I originally thought. 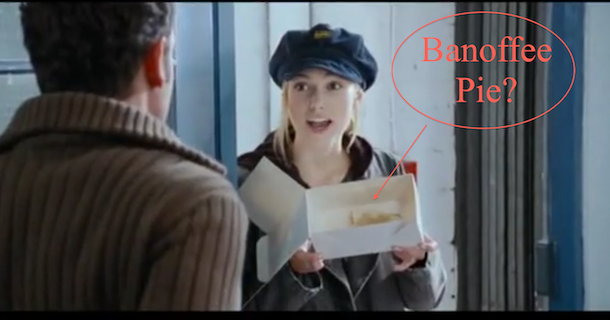 I’ve wanted to try Banoffee Pie since seeing this scene for the first time, even though there are jokes made on Keira’s character’s part that she has “terrible taste in pie”. I could not reconcile “terrible” with the ingredients in my cookbook’s version of this recipe…dulce de leche, bananas, cream, sugar, instant coffee. What could possibly go wrong there? The answer is, of course, nothing. Keira, you’re wrong-o. I followed Ken’s recipe precisely on this one and used prepared dulce de leche rather than making it from scratch. Turns out that Trader Joe’s has a very delicious jar of it, at least around the holidays. Joe never lets me down. *The screenshot was borrowed from this top-notch post on the same subject, which I highly recommend reading in its entirety. It includes a variant recipe for banoffee pie, history on where this pie originated, and some classic jokes about the zip-up turtleneck that features so prominently in the referred-to movie scene. It’s always a little bittersweet, baking pies for auction. I imagine it must feel like when painters sell their art; there is consolation in knowing that someone else will enjoy your creative work, but isn’t that joy sometimes mixed with the sentiment, “but…but…I want to keep it!”? I’ll be honest, it’s borderline maddening when you’ve made your whole house smell like apples and caramel and cinnamon and know you aren’t getting a single bite. It’s okay though. Really, it is. 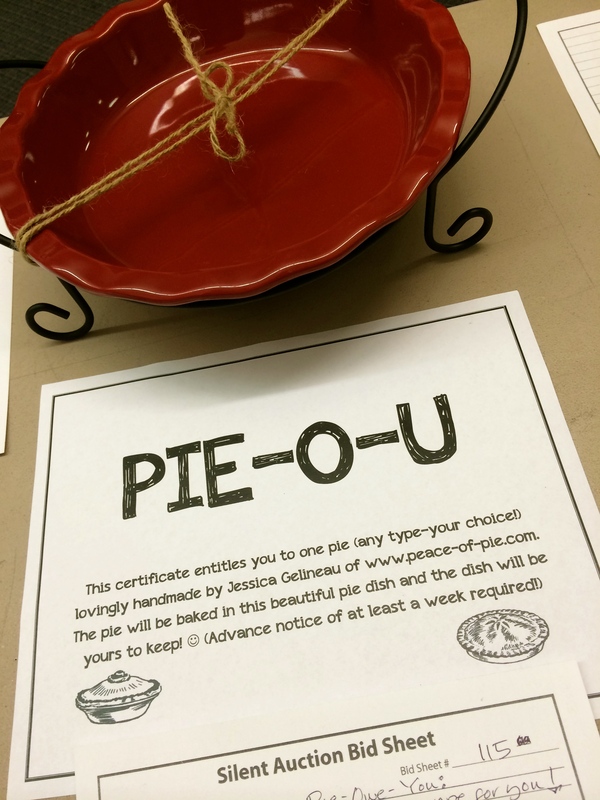 Not only did someone else (my super-fun 3rd grade student Sam’s uncle, Jeff) have the kindness to place the highest bid on this pie and support a wonderful school in the process, I got to bake it. And if that sounds like a paltry comfort, let me put it this way; if the only part of the pie-making process I cared about was the eating, I would have given up on this whole thing a long time ago. Baking and sharing are at least two-thirds the fun. Here’s the finished product, and as I alluded to before, the smell coming out of the oven towards the end of the hour it baked was just mean. Cruel. I heard tell that this boozy pie may have been destined for Jeff’s bachelor party (he’s getting married soon!) Here’s hoping it was a big hit. And thanks again, Jeff, for supporting a great group of kids. November was the month for Visitors. In fact, I think there were only a couple of days in total that our guest room was free. It was fantastic. One thing about Visitors: they often expect Pies. Even the smallest ones. When you see these items in your kitchen, it’s time to get excited. 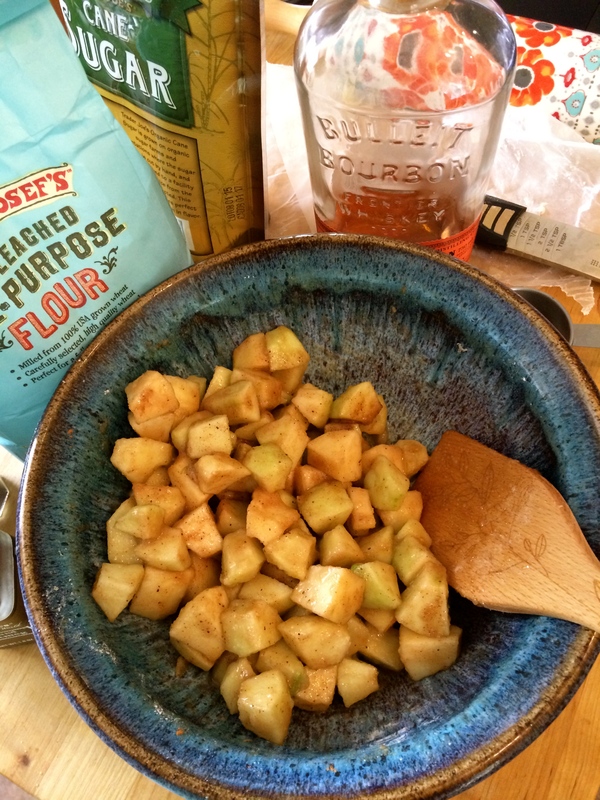 A Caramel Apple-Pecan Pie is likely on the way. A total of 40 caramels are required for this pie. I love the saltiness of Trader Joe’s Fleur de Sel caramels, so I used those. No regrets. 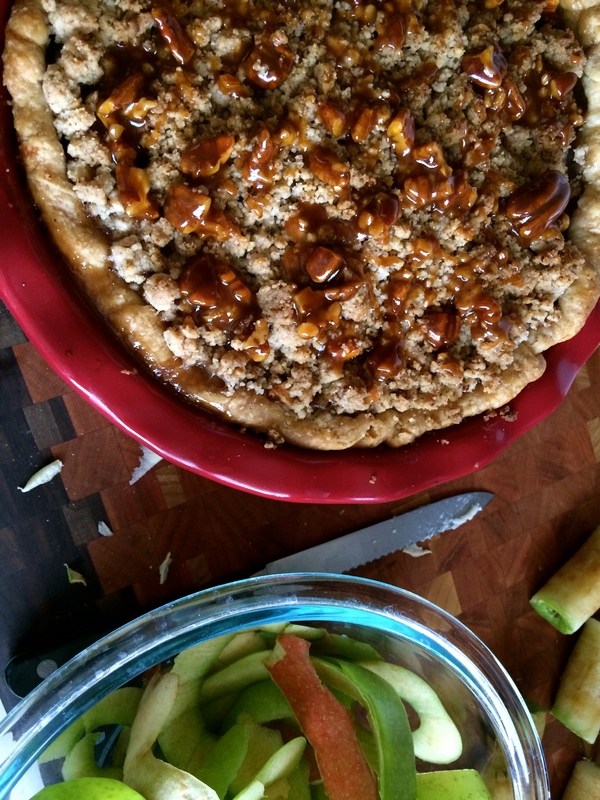 When I first read the recipe, I thought I was going to have to unwrap and chop each caramel into quarters. Then I realized that I only had to cut up ten of them…the ones that go into the pie crust…and I stopped banging my head against the wall. This isn’t the fastest pie ever to make (1. Pastry 2. Apple Caramel Filling 3. Pecan Crumb Topping 4. Caramel and Pecans) so be forewarned. 1000% worth it, though. Would you look at that beauty?! There are few things I enjoy more than a table full of good food, friends and family. And this night was especially special because it’s not often that I get a table full of New Jersey all the way in California. Mike works for M&M’s/Mars, so his taste in sweets is impeccable. Even Obi tried to get his paws on a slice. Little rapscallion. 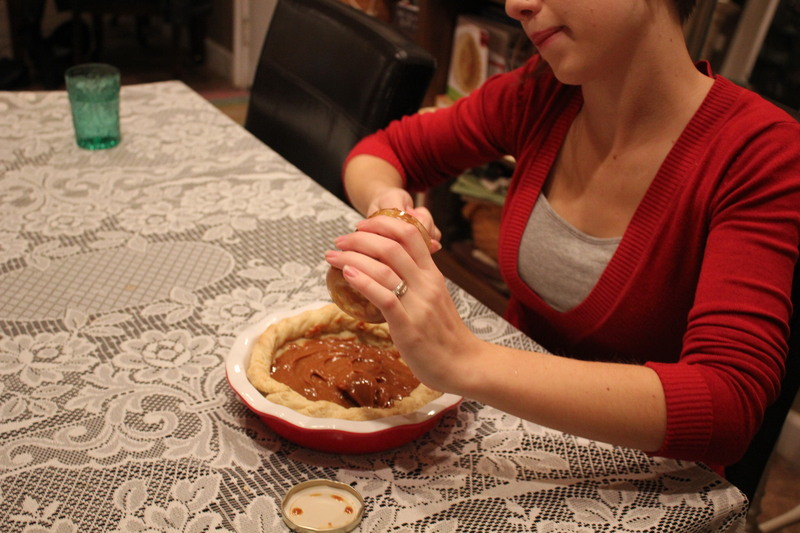 Click here to receive my new posts via E-mail the moment I bake a new pie! You can send me a private message at the.pie.diaries@gmail.com. Thanks so much for visiting!